9 , 8 1 6 , 5 4 7 , 2 3 0. Up until now, I have used the divisibility rules to ensure that the property works for n = 1, 2, 3, 4, 5, 6, 8, 9, 10. But I haven’t used n = 7 yet. Step 10. The number formed by the first seven digits must be a multiple of 7. There is a very complicated divisibility rule for checking to see if a number is a multiple of 7. However, at this point, it’s easiest to just divide by 7 and see what happens. : not a multiple of 7.
: a multiple of 7!!! O , 8 O 6 , 5 4 7 , 2 O 0.
where O represents the remaining three odd digts. (The last digit is 0 and not an odd number.) There are 24 possible answers left. Step 9. The number formed by the first three digits must be a multiple of 3. By the divisibility rules, this means that the sum of the first three digits must be a multiple of 3. 3 + 4 + 7 = 14, not a multiple of 3. 3 + 4 + 9 = 16, not a multiple of 3. 7 + 4 + 9 = 20, not a multiple of 3. 1 + 4 + 3 = 8, not a multiple of 3. 1 + 4 + 7 = 12, a multiple of 3. Therefore, for the second form, the first three digits could be either 147 or 714. 1 + 8 + 7 = 16, not a multiple of 3. 1 + 8 + 9 = 18, a multiple of 3. 7 + 8 + 9 = 24, a multiple of 3. Therefore, for the third form, the first three digits could be either 189, 981, 789, or 987. 1 + 8 + 3 = 12, a multiple of 3. 3 + 8 + 9 = 20, not a multiple of 3. Therefore, for the fourth form, the first three digits could be 183, 381, 189, or 981. 9 , 8 1 6 , 5 4 7 , 2 O 0. So we’re down to 10 possible answers left. In tomorrow’s post, I’ll finally find the answer. O , 2 O 6 , 5 4 O , 8 O 0. O , 8 O 6 , 5 4 O , 2 O 0.
where O is one of 1, 3, 7, and 9. (The last digit is 0 and not an odd number.) There are 96 possible answers left. Step 8. The number formed by the first eight digits must be a multiple of 8. By the divisibility rules, this means that the number formed by the sixth, seventh, and eighth digits must be a multiple of 8.
: a multiple of 8.
: not a multiple of 8. We see that is odd, and therefore is not a multiple of 2. Therefore, is not a multiple of 4 (let alone 8). For each of these, there are 3! = 6 ways of choosing the remaining odd digits. Since there are four forms, there are 4 x 6= 24 possible answers left. In tomorrow’s post, I’ll cut this number down to 10. O , E O 6 , 5 4 O , E O 0.
where E is one of 2, 4, 6, and 8 (not already included) and O is one of 1, 3, 7, and 9. (The last digit is 0 and not an odd number.) There are 192 possible answers left. Step 7. The number formed by the first four digits must be a multiple of 4. By the divisibility rules, this means that the number formed by the third and fourth digits must be a multiple of 4.
also has to be a multiple of 4, which means that has to be a multiple of 2. Since is already of a multiple of 2, that means that must be a multiple of 2, or that must be odd. For each of these, there are 4! = 24 ways of choosing the remaining odd digits. Since there are four forms, there are 4 x x 24 = 96 possible answers left. In tomorrow’s post, I’ll cut this number down to 24.
where E is one of 2, 4, 6, and 8 and O is one of 1, 3, 7, and 9. (The last digit is 0 and not an odd number.) There are 576 possible answers left. Step 6. The number formed by the first three digits must be a multiple of 3. Also, the number formed by the first six digits must be a multiple of 6, which means it’s also a multiple of 3. By the divisibility rules, the sum of the first three digits must be a multiple of 3, and the sum of the first six digits must be a multiple of 3. Therefore, the sum of the fourth, fifth, and sixth digits must be 3. 5 + 2 + 4 = 11, not a multiple of 3. 5 + 2 + 6 = 13, not a multiple of 3. 5 + 2 + 8 = 15, a multiple of 3. 5 + 4 + 6 = 15, a multiple of 3. 5 + 4 + 8 = 17, a multiple of 3. 5 + 6 + 8 = 19, not a multiple of 3. For each of these there are 2! = 2 ways of choosing the remaining even digits and 4! = 24 ways of choosing the remaining odd digits. Since there are four forms, there are 4 x 2 x 24 = 192 possible answers left. In tomorrow’s post, I’ll cut this number in half. I really like this problem because it’s looks really tough but only requires knowledge of elementary-school arithmetic. To illustrate this idea, let me give an example that almost works: 9,632,581,470, a ten-digit number that uses each digit exactly once. The first digit is 9, which is clearly a multiple of 1. The first two digits form the number 96, which is clearly a multiple of 2: . The first three digits form the number 963, which is a multiple of 3: . The first four digits form the number 9632, which is a multiple of 4: . The first five digits form the number 96,325, which is a multiple of 5: . The first six digits form the number 963,258, which is a multiple of 6: . The first seven digits form the number 9,632,581, which is a multiple of 7: . The ten-digit number is a multiple of 10: . So, this number works for 9 of the 10 cases… but we need the number that works for all 10 cases. ___ , ___ ___ ___ , ___ ___ ___ , ___ ___ ___. Each of the blanks has to be a digit from 0 through 9, and each can only be used once. Therefore, there are 10! = 3,628,800 possible answers, but we’d like to whittle this down to a more tractable number. ___ , ___ ___ ___ , ___ ___ ___ , ___ ___ 0. Each of the blanks has to be a digit from 1 through 9, and each can only be used once. Therefore, at this stage, there are 9! = 362,880 possible answers. ___ , ___ ___ ___ , 5 ___ ___ , ___ ___ 0. Each of the blanks has to be one of the 8 remaining digits, and each can only be used once. Therefore, at this stage, there are 8! = 40,320 possible answers. is a multiple of 9. So considering the first nine digits gives us no new information. Step 4. The first digit has to be a multiple of 1. However, this isn’t helpful since every digit is a multiple of 1. So considering only the first digit gives us no new information. I’ll continue this discussion with tomorrow’s post, where I’ll reduce the number of possible answers from 40,320 to only 576. To illustrate this idea, let me give an example that almost works: 9,632,581,470, a ten-digit number that uses each digit exactly once. In this series, I plan to discuss my solution of this problem using the rules of divisibility. I’ll start my solution with tomorrow’s post. 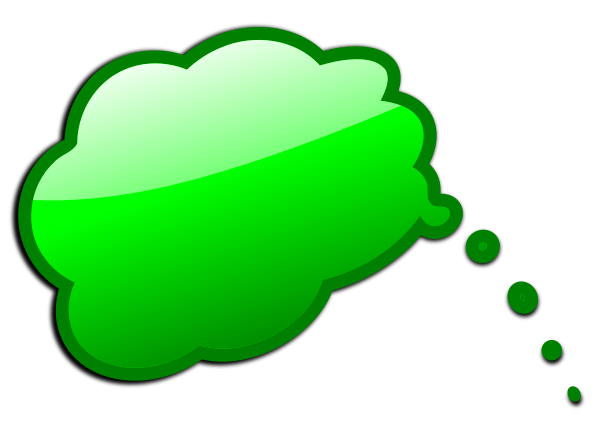 In the meantime, if you’d like to think about the solution on your own, I offer this green thought bubble to give you some time to think about it on your own.